We check out the Britain-set racing game's E3 demo. Benjamin Penrose almost gets misty-eyed when he talks about recreating Playground Games' native Britain for Forza Horizon 4. "The Scottish mountains, the Welsh valleys, the English countryside. It's seldom seen in video games, and highly different from the Australia we showed you in the last game," he says, in his wistful art director cadence, in the basement of Microsoft's offsite E3 epicenter. The rally car on screen careens through a sparkling meadow and narrowly dodges a peaceful herd of sheep. "We came to the conclusion that we couldn't do seasons without Britain, and we couldn't do Britain without seasons." The demo starts in summer, but quickly gives way to a gorgeous, burnt-orange autumn, with bushels of fallen leaves congregating on the asphalt, under one of those liquid-pink after-school sunsets. Next up is a gentle winter, where we're guided solely by the globby lights emanating from an endless line of stone-hewn cottages. Back to spring—that awful humid English spring—and its hot rain, and muddy potholes, teeming vermin. Seasons might seem like an odd selling point for one of the world's most celebrating racing series, but hats off to Playground: the studio has made every iteration of their personal Britain look postcard-ready. "We want to give people an experience that's fun and rich, and I think you only do that by showing the best of a place," says Penrose. "We're showing you the best of our seasons. Even winter." There's more to this than the looks, obviously. The weather will affect how your car handles, and Penrose makes reference to some strange, almost Zelda-like exploration functionality that will go with certain seasons. For instance, during winter a lake freezes over, and you can drive your car to a handful of islands you don't have access to during the fall or summer. Like the previous games, you can expect a sprawling open world, but this time the action can take place on a 72-player server. That's right, no more Drivatars. Every motor on the road will be powered by a real player (if, of course, you choose to play online). If you're someone with a spotty connection or you have a latent fear of griefers, don't worry, Playground has your back. Penrose says that you won't be ejected from Forza Horizon 4's world if your connection goes out, which means you can shift seamlessly from single-player back to multiplayer. As for wannabe Mad Max-types who are licking their chops at the opportunity to run every player they meet off the road? Screw them. There's an auto-ghosting feature, which means that every other car that comes into contact with your vehicle will phase right through. Instead, collisions will only be activated once you've grouped up with someone—ostensibly your friends, who you wouldn't mind rear-ending. Penrose also notes that the ghosting will let you "pause" the game, because you won't have to worry about anyone pushing your McClaren into the ocean while you're putting the coffee on. You'll just have to imagine this screenshot looking nicer without the gigantic watermark. 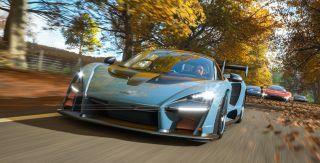 The last wrinkle we learned at the demo is that Playground is reworking its progression system to reward all the different ways players enjoy Forza. For instance, if you're one of those maestros with brush tools, you can unlock everything in the game without ever leaving the paint shop. They didn't divulge exactly how that would work, but it's good news for those of us who enjoy racing games for their aesthetic value, rather than shaving stray seconds off the time trial. All of these are smart, tasteful innovations. Four games in, Playground has gotten really good at making open-world driving games. It feels like every time they make a Horizon, they understand what people want out of the series a little bit better.